Raindrops and Daydreams: News: Tsuchiura City Museum tie-in "Basara-tachi No Busou -The armor and swords of the warlords who ran through the Warring States-"
News: Tsuchiura City Museum tie-in "Basara-tachi No Busou -The armor and swords of the warlords who ran through the Warring States-"
Not quite the spectacular burst of information I was hoping for, but Capcom have updated their news page with details of a collaboration between Sengoku Basara and the Tsuchiura City Museum in Ibaraki prefecture. The "Basara-tachi No Busou -The armor and swords of the warlords who ran through the Warring States-" event will run between 16th March and 6th May 2013. The idea is that the museum will display weapons, armor and helmets worn by the famous real-life warlords which appear in Sengoku Basara. Three of the museum's exhibition rooms will display armaments from warlords who appear in Sengoku Basara. Character illustrations from the series will be on display in a hall in the museum. Ready to go to war in the exhibition hall will be full-sized replicas linked to the warlords whose armor and blades were on display. Take a commemorative photograph together! You can experience Sengoku Basara 3 Utage and Sengoku Basara HD Collection (PS3 editions only). Original Sengoku Basara goods will be sold in the Machikado Kura Daitoku store! Prizes for those who visit! The first 10,000 visitors will receive a 'special exhibition official guidebook'. The museum can be accessed by car (free parking available) or by train. The JR Joban line runs from Ueno station in Tokyo to Tsuchiura station and the journey takes 70 minutes using ordinary trains or 50 minutes on an express service. The museum is at Kijou Park, which is a fifteen minute walk away from the station's west exit. If you'd prefer not to walk, you can take a bus from Nishiguchi bus stops 4 and 5 and disembark a minute's walk from the museum at Kijou Kouen. Alternatively, take the Tsukuba Express (TX) train from Akihabara to Tsukuba station. The train journey takes 45 minutes. Upon reaching Tsukuba, take the bus from Tsukuba Centre bus stop 3 and disembark at Senzokuchou. It's an eight-minute walk from there to the museum. Tsuchiura isn't very far from central Tokyo; I'd be interested to hear from anyone who visits the museum! The only other tidbit today came to my attention just after I originally posted the news above. It's an even more tenuous link to the series: the Capcom Unity Japan page on Facebook is running a New Year prize draw which will close tomorrow at midnight. I didn't even know there was a Capcom Unity Japan presence on Facebook in the first place, but it seems they have competitions on a regular basis. Of the five people who like the page and apply for the prize draw, one will receive a Sengoku Basara goody bag containing a complete set of eight plastic Sengoku Basara keychains and a pair of Masamune/Yukimura plushies. 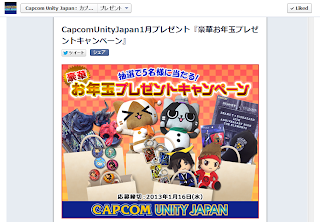 The other four prizes relate to Monster Hunter, Biohazard (Resident Evil) and Gyakuten Saiban (Ace Attorney). All you have to do it 'Like' their page and choose which prize bag you want to try for, granting permission to their app when asked. Please note that prizes can only be posted to Japanese addresses.